Cricket is a game of tradition and the Napa Valley Cricket Club (NVCC) continued their annual tradition this past weekend with their season opening “World Series of Cricket” game, which pits club members against each other based on their country of birth. After a comfortable victory in 2014 the Rest of the World (ROW) team succumbed to a strong Australia / America (AA) team, in what was the closest game yet. 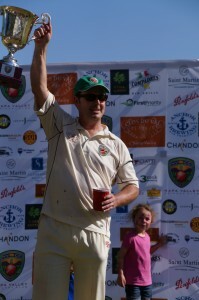 The AA team eventually ran out winners by 39 runs. The game saw the introduction of a number of new members recruited over the winter months and it was one of these new members, Australian John Leake, who had the biggest impact on the game. Leake scored a maiden century on debut for the AA and gracefully retired on the 100 mark to allow others to bat. Dale Moorehouse and Bijoy Ojha took over pitch preparation responsibilities from head grounds-man Pete Carson and turned out a medium paced, consistent pitch that allowed for a high scoring game. Carson was absent from the proceedings having returned to Australia to spend time with his family after the recent passing of his mother. Both teams wore black armbands for the game and observed a minute’s silence in the morning as a mark of respect to Carson and his family. The toss was to be key in the game with a new mat laid on the pitch. AA captain Rob Bolch called heads as Calistoga Mayor, Chris Canning, tossed. Bolch’s call was to be in vain however as tails it was and ROW captain Bill Nancarrow choose to bowl first. Nancarrow’s decision looked inspired as the swing bowling of Bernie Peacock was responsible for both AA openers in the fifth over with Michael Rule going for 5 runs off only 11 balls, while NVCC President Phil Bourke went for 3 runs off 16 balls. 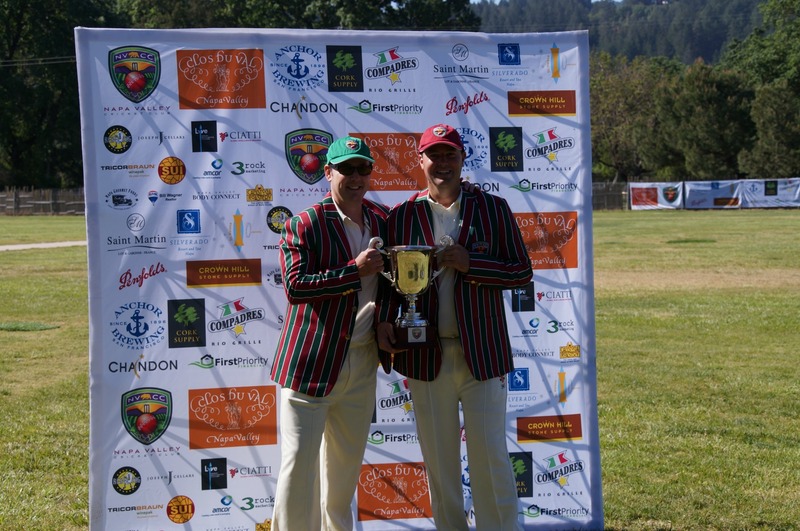 A long period of attritional cricket followed as the AA batsmen Nick Withers and John Leake dug in for what would turn out to be the game winning partnership. The pair notched a total of 136 runs in their third wicket stand with Withers eventually falling to the bowling of Nancarrow for 41 off 53 balls. Leake continued his assault on the ROW bowlers and he took a particular liking to the slow loopy bowling of Irishman Andrew Healy who went for 32 runs in just two overs including a procession of boundaries. Leake retired on reaching his century and that allowed Tom Donegan and Captain Bolch to bat through their 35 overs and end with a score of 234 runs, an average of 6.6 per over and a formidable target. 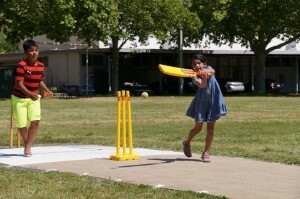 The lunch break provided an opportunity for spectators and kids to venture to the middle of the field for a demonstration of batting and bowling, part of the clubs community efforts. 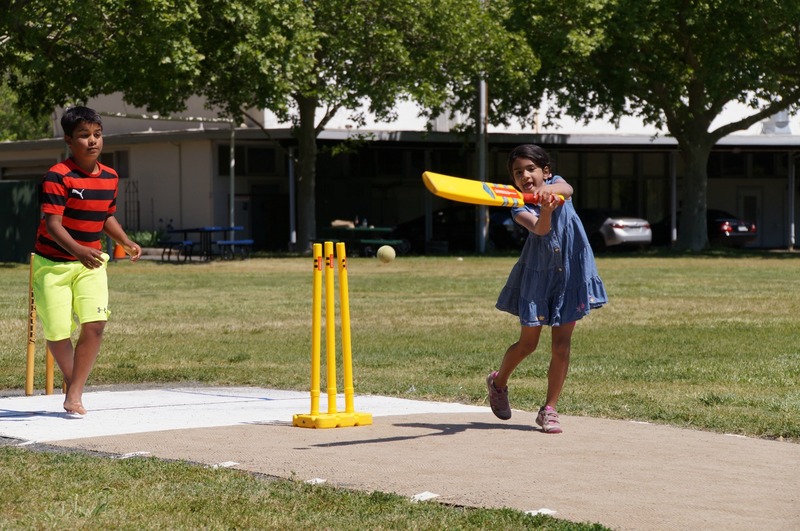 Activities for the children included a jumpy house, potato sack races, three legged races, relays, soccer, t-ball, fabulous face paintings, and an Arts and Crafts area and of course kids cricket supervised by members of the Boys & Girls Club of Calistoga. After the lunch break the ROW team started the chase solidly despite the loss of Moorhouse for a first-ball “golden” duck as Amritpal Singh hit a quick-fire 25 from 21 balls. An assertive innings from Moe Masood of 48 off 33 balls was the foundation for the ROW middle order as he , Bijoy Ojha and captain Nancarrow took the game to the AA team. The ROW team were undone by great line and length bowling from AA captain Bolch and Tom Donegan who took three wickets each. They were backed up on the field by excellent fielding from American and Napa native, Brett Weis, whose stunning catch to dismiss Ojha, one of two catches he took for the day, was the best catch ever seen at the Fairgrounds. The ROW team ultimately ran out of both time and wickets in the chase and ended up 39 runs short. The traditional Clos du Val “Man of the Match” Award went to John Leake of the AA team for his great performance with the bat. America / Australia Batting – John Leake 100 (retired) off 74 balls (5 x 4, 9 x 6), Tom Donegan 42 off 24 (2 x 4, 4 x 6), Nick Withers 41 off 53 (2 x 4, 1 x 6). Rest of the World Bowling – Bernie Peacock 2 wickets for 13 runs off 5 overs incl 2 maidens, Amritpal Bhatal 1 for 17 off 5. Rest of the World Batting – Moe Masood 48 off 33 balls (3 x 4, 4 x 6), Bill Nancarrow 37 off 31 (1 x 4, 4 x 6), Amritpal Bhatal 25 off 21 (5 x 4), Bijoy Ojha 24 of 57 (3 x 4). America / Australia Bowling – Rob Bolch 3 wickets for 20 runs off 5 overs, Tom Donegan 3 for 34 off 5, Tim Irwin 1 for 19 off 4 incl 1 maiden. Clos du Val, Silverado Resort, Compadres Rio Grille, Tonnellerie Saint Martin, Penfolds, St. Helena Optometry, First Priority Financial, Anchor Steam Brewing, Amcor, Joseph Cellars, Ciatti & Co., Rebel Dog Hot Dogs, Stone Universe, Lyve Systems Inc., Calistoga Roastery, TricorBraun WinePak, 3 rock marketing, Napa Gourmet Foods, Napa Valley Body Connect. 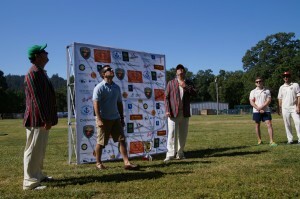 Sunday 3rd May 2014 at The Fairgrounds in Calistoga vs. SF Seals from 10.30am.